Welcome to the Trapper 1.0 beta repository! 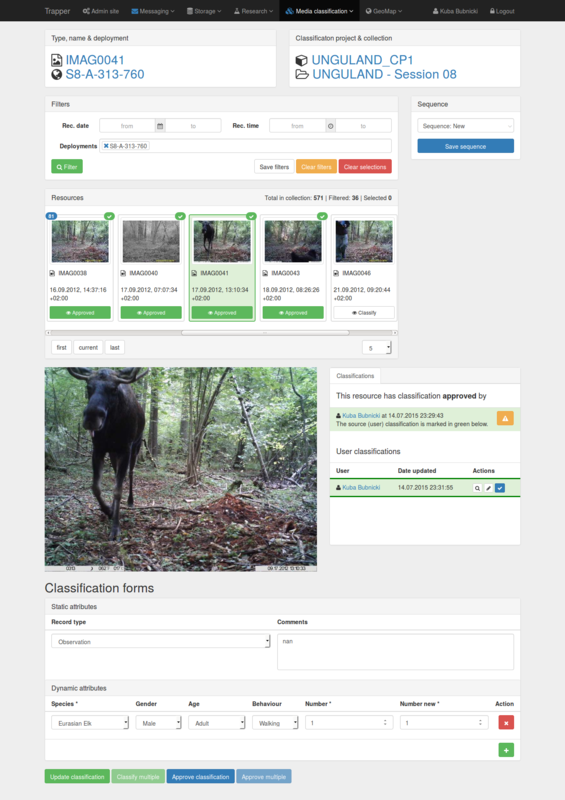 Trapper is an open source, django based web application to manage camera trapping projects. Motion-triggered camera trapping is increasingly becoming an important tool in ecological research. Because of the nature of collected data (multimedia files) even relatively small camera-trapping projects can generate large and complex datasets. The organization of these large collections of multimedia files and efficient querying for a particular subsets of data, especially in a spatio-temporal context, is often a challenging task. Without an appropriate software solution this can become a serious data management problem, leading to delays and inaccessibility of data in the long run. We propose a new approach which, in contrary to available software solutions, is a fully open-source web application using spatially enabled data that can handle arbitrary media types (both pictures and videos), supports collaborative work on a project and data sharing between system users. We used state of the art and well-recognized open-source software components and modern, general purpose programming language Python to design a flexible software framework for data management in camera trapping studies. # by default it is "trapper"
These settings should not be changed in the settings.py file because it can be accidentally pushed to the repository. Use the settings_local.py instead (this file is excluded from git). If local SMTP server is used it has to be configured to be able to send email messages. Configuration of the SMTP server is out of the scope of this documentation. When a new user or new research project is created, emails are sent to all admins defined in a standard django settings file: settings.ADMINS. It is preffered to define admin list in settings_local.py to protect emails from being publicly available in the repository. The following steps require the root privileges. Update your /etc/nginx/nginx.conf using a template config file conf/nginx.conf. Copy or symlink conf/trapper.nginx.conf to the nginx config directory (by default it is /etc/nginx/sites-available), then symlink the copied file to /etc/nginx/sites-enabled. Default trapper configuration assumes that you have already generated SSL certificates. For example you can get free SSL certificates from Let's Encrypt. You should not use trapper.pl in your production unless you are the owner of this domain. Likely the browser will inform you about the wrong SSL certificate. There are few external services used by Trapper that are either required or preferred simply to make your work with the application more convenient and more productive. The email service is the only one that is required. An access to the SMTP server is required to make the notification framework working correctly. Deployment notes section provides the example of configuration of the email service. The SMTP server configuration is not documented here. The trapper administrators are free to use the most suitable solution. Celery is an external service used for running asynchronous tasks at the server. It is a task queue with focus on real-time processing, while also supporting task scheduling. Each resource can have a thumbnail assigned. The process of thumbnails generation (for images and video files) can be very time consuming. That is why this process is by default moved to a separate asynchronous task and done by celery. Generating thumbnails for images uses Pillow. Generating thumbnails for videos uses ffmpeg which has to be installed on the server. Collections of resources that users want to process can be very large and processing them can be very time consuming. Thus, a whole process is delegated to the celery which will process them asynchronously. The processing of uploaded collections has no custom settings to control the celery behaviour. Tasks are always delegated to the celery unless the celery is disabled with CELERY_ENABLED set to False. Trapper users have dedicated directories that are created automatically when users accounts are activated. These dedicated directories are associated with users profiles and recognized by the system. Resources or collections of resources can be then uploaded to the storage server using FTP or SSH protocols. The root user's directory is defined by EXTERNAL_MEDIA_ROOT setting. When the administrator of Trapper wants to enable an alternative upload through (S)FTP for the user alice, he needs to configure the alice (S)FTP account on the server and point it's home directory to EXTERNAL_MEDIA_ROOT/alice/. He has to take care about all necessary permissions that have to be set to allow the user to read and write files within its home directory. The configuration of the (S)FTP (or SSH) server is out of the scope of this documentation. A base operating system under which Trapper was developed and tested. The open source and industry standard relational database management system (RDBMS) with PostGIS as its spatial extension. nginx [engine x] is an HTTP and reverse proxy server, a mail proxy server, and a generic TCP proxy server. This pure-python application is used to serve Trapper project. This application is used to control all project related external applications like celery. This python application is used to run various tasks in asnynchronous mode allowing Trapper to work faster and more efficient. The celery is used to generate thumbnails from large files or videos, or to process uploaded collections by users. uMAP uMap lets you create maps with OpenStreetMap layers in a minute and embed them in your site. It uses django-leaflet-storage and Leaflet.Storage, built on top of Django and Leaflet. Bootstrap Sass Official which is official SASS version of Twitter Bootstrap. This library provides a set of HTML components and CSS styles used for Trapper scaffold creation. Font Awesome - webfont of vector icons used in the project. Official angular module for cookies management. Official angular module which improves angular templates data binding. Extremaly powerful library for date parsing & manipulation. Complete solution that extends default HTML select controls. CSS styles for Select2 so it fits Twitter Bootstrap feel & look. Jquery Widget which is just a timepicker. This library extends standard HTML5 video players. Video JS plugin that allows to set and get video sequences. X-Sendfile (see for example http://wiki.nginx.org/XSendfile) allows verification of django-based user's permissions before specific content is sent to a user (e.g. multimedia file). However, Django will not serve a content - it is done by a web server that can handle it much more efficient. # Header that will be added to a response. Differs between web servers. All resources (part of the storage application) use X-Sendfile to control the access to the file, file_thumbnail, file_preview and extra_file model fields. Trapper does not use direct urls to serve images/movies/audio. All media files are stored in SENDFILE_ROOT + SENDFILE_MEDIA_PREFIX and each handled field has its own method responsible for returning a proper url. Instead of returning a direct url to a media file, a special serve-view url is returned. In this view a requested media file of given resource is verified against currently logged in user's permissions. If a user can view details of this resource, then a media file can be served by nginx and django will add special headers to a response. Otherwise a default image (access forbidden) is returned. Using the internal flag allows files from a specified location to be served only by nginx. Since nginx will not serve media files directly, django admin panel had to be altered to allow using fileinput widget (which shows url to actual media url if given field is not empty). Widget combined with a special view allows user to see a media file from protected directory directly but only if request is made by user that is staff or is superuser. Otherwise the forbidden response is returned.